Sorry it’s been a while since I posted. Took a break for a lot of reasons. Our son got married, had a few health issues going on again and in the midst of all of that, we are starting the next chapter of our lives. As soon as we returned from our son’s wedding we started looking for a new home, we’ve been discussing this for a while now and really wanted to wait until after the wedding. We looked at a lot of homes and couldn’t find anything that we liked so we finally found an acre lot and are in the process of buying that and my husband has done the building plans for the new home, he’s an engineer and designed the house we are living in now. We’ve been through this process before, 23 years ago, and the same builder will be building the new home. So a lot of our time has been spent picking fixtures the past several weeks and we still have a lot of work ahead of us. If you follow me on Instagram, you’ll be able to watch the progress once we break ground the beginning of September. Luckily the lot is only about 15 minutes from our current home! We hope to be into the new house by the end of the year. So, onto the card set. It took me a few days to create this set, but had fun doing it. I think an average person can do it in an hour or two. With me and my chronic illness, I have to take more time to do it. So I started with an 8 1/2 x 11 sheet of smooth white cardstock and created a full sheet of the floral panel from Altenew Peony Bouquet stamp set. I stamped the images repeatedly using the layering stamps and several colors of inks. I first stamped all of the outline images with Simon Says Stamp Intense Black Ink then I started stamping the other layered images. The greens were first stamped with Simon Says Stamp Green Apple then Simon Says Stamp Green Leaf. 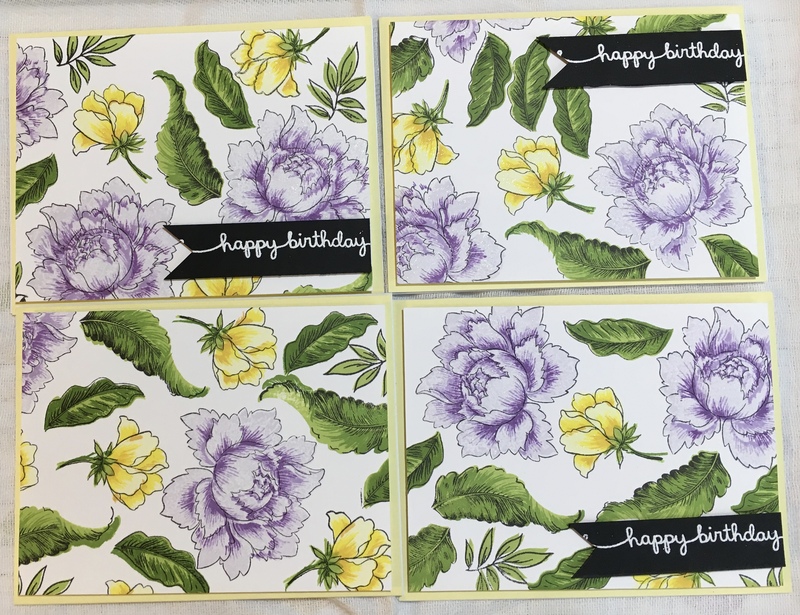 The yellow flowers were layered with Hero Arts Soft Yellow (double stamped), Hero Arts Lemon Yellow, and Simon Says Stamp Sunshine. The purple flowers were stamped with the Altenew Shades of Purple Cubes. I used Soft Lilac, Lavender Fields and Deep Iris. If you don’t have any of these colors, don’t worry about it. Try what you have in your stash. It took me several tries to come up with the yellow combination I used for these cards. I even had to double stamp one color to get the color combination I liked. Try what you have and play with different combinations. Once my entire background was stamped, I cut it into 4 pieces that were 4 1/4 x 5 1/2 then decided I wanted to mount it onto yellow cardstock so, I cut each piece down by 1/4 on 2 sides then took Simon Says Stamp Lemon paper and made those into 4 card bases. I also used Simon Says Stamp Black paper and stamped “happy birthday” using Lawn Fawn Scripty Saying with Versa Fine ink and white embossing powder and embossed those and cut them into flags. I only did three since I had three birthdays in May and needed three birthday cards. I’ll hold onto the fourth for when I need another card. I used fun foam to pop up the print piece onto the card base and also popped up the the flag with the birthday message with foam tape.